Not all dogs are fast eaters, but many are. You can tell your dog eats too fast, when he is impatient as you reach for the bag of kibbles, or when half of the food disappears as you finish filling the bowl. The situation is not at all unfamiliar to us. 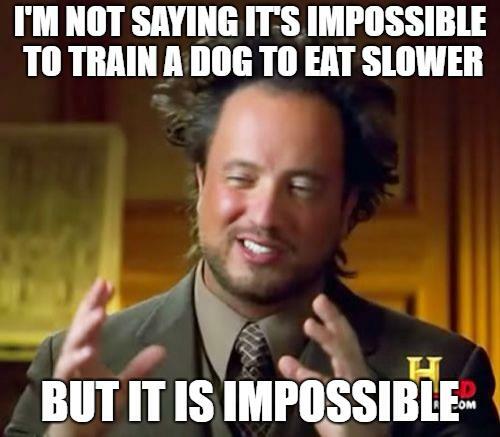 But, in fact, many dog owners will confirm that their dogs are not only quick eaters, but also act like they are starving, even if it isn’t true. So is there anything you can do to prevent your dog from eating too quickly–or, at least, to slow down his voracity? Before that, let’s delve into a question whether quick eating can cause problems. Is it bad that dog eats too fast? Maybe that’s just the way it is, and so be it? Unfortunately, the situation can become bad. 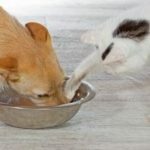 First comes the annoyance–it really is hard to fill the bowl with your dog’s head in the way, and it is also frustrating when your dog finishes a meal in seconds and then acts like it never happened. More dangerously, however, it can lead to medical problems. After all, it is already proven in humans, that eating in a rush is wrong on almost every level imaginable. And dogs are no different. Besides the direct risk of choking, coughing, or vomiting, long-term problems may arise from numerous things associated with rapid eating. These include air gulped among the bites, increased agitation from speed eating, and partial chewing of food, which leads to improper digestion. The good news is that there are things to do to slow down your dog’s eating habits. Training, however, isn’t one of them. Prevent other pets near your dog’s food. Competition is a natural reason why your dog eats too fast. In fact, if there is a dog who is a lazy eater, one way to soothe it is to feed him near other pets. 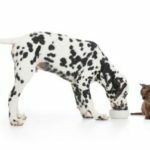 On the contrary, if you have two dogs who eat as if it is a race, feeding them at a distance or in separate rooms can help. Having a cat lurking around your dog’s bowl while he is eating, is not helpful either. So prevent this from happening—feed the cat at the same time or lock him in another room until the dog finishes. We suppose, it’s not going to take long. Use a slow feeder bowl. This is a bowl that has several grooves at the bottom, so it is not easy to grab a mouthful of food. Pet stores offer plenty of varieties, not only for dogs, but also for cats. The common thing about these bowls is that they are hard to eat from, what is exactly what you want. Alternatively, you can go for a food puzzle, which not only slows your dog down, but also mentally stimulates him and reduces boredom. 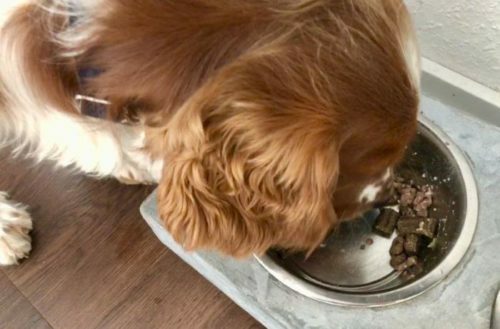 Not all dogs love food puzzles, however, so we recommend that you start with a slow feeder. Try a food hunt with your dog. The idea is simple: feed only half of the food at a regular meal, and hide the rest of it in small batches throughout the house or garden. Start with easy-to-discover locations that you can help with. Later, you can go for more advanced locations and use all of the food during these hunts, eventually forgetting your dog has ever had “regular meals”. Feed from a large plate or surface. This is among our favorites. Do not concentrate the food in a small bowl where a dog can grab a mouthful of food. If you serve the food on a larger plate or a baking tray, or simply scatter it over a broad surface of the floor. Then eating will take more time as the dog can only grab a piece or two at a time. Do not feed your dog when he is excited. Okay, most dogs are excited about food, which is why there is a problem in the first place. But consider other sources of excitement, most commonly, the excitement of you returning home. It’s convenient to feed a dog upon arriving, but he is simultaneously excited to see you. He’s gulping rapidly not only because the food is delicious, but also because he will get to interact with you as soon as he finishes. How about postponing the meal for, let’s say, half an hour after your arrival? Unless you are really late and the dog is starving, it’s okay to come home, greet the dog, have some time to interact first. Provide food only when his excitement (about you) has gone down. Please note, however, that you shouldn’t change the feeding schedule abruptly. It’s better to gradually shift your dog’s meal to a desired time. Use kibbles made for slower eating. These are kibbles that are large in volume but small in mass. They are either porous, hollow, or are shaped like doughnuts. Many foods for large breeds are already made like this. For example, one might wonder what is so special about a dog food intended specifically for Labrador Retrievers. Do they have different nutrient needs that other dog breeds? Not exactly, it’s mostly marketing. But Labradors are indeed prone to fast eating, and therefore their kibbles are designed to be helpful if the dog eats too fast. Therefore, when he grabs a mouthful of kibbles, it actually contains less food. Switch to wet food. Wet food contains more volume for the same amount of nutrients. Therefore each meal will also be larger and take more time to consume. An additional benefit is that wet food provides satiety sooner than kibbles. 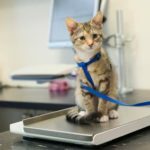 Wet food is more expensive and less convenient for feeding, but it does, on average, provide better nutrition than dry food. Provide more meals and space them out evenly. The majority of people feed their dog two times a day, which is a good choice in most cases. However, often the reason that dogs eat too fast is too much time since the previous meal. If you feed your dog, for example, at 9 AM and 6 PM, the gaps between the meals are nine and fifteen hours. Ideally, however, they should be as close to 12/12 as possible. Remember: it is natural for dogs to eat their food as soon as possible because nature is harsh. If they did not eat it on time, someone might take it away. Luckily, your dog now lives in an environment where his food is safe, unless the cat snatches something, that is. Other than that, it’s safe and reasonable to try and soothe your dog’s rapid eating habits a bit. His survival abilities will not suffer from that. In fact, it is quite the opposite. 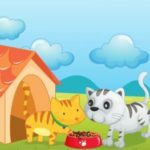 Do cats share food or should you feed your cats separately?